When a virus infects something, it has to overcome a wide range of antiviral responses. In mammals, those responses include innate responses like those mediated by toll-like receptors; natural killer cells; apoptosis; cytokines; and specific immune responses including B cells (antibodies), T helper cells, and cytotoxic T lymphocytes. Any successful virus has to be able to deal with those defenses, and especially in the larger viruses such as adenoviruses, poxviruses, and herpesviruses (which have the extra room in their genomes) there can be a dizzying number of immune evasion molecules. Many of these viruses encode defenses against cytotoxic T lymphocytes (CTL, or CD8+ T cells), in the form of molecules that target class I major histocompatibility complexes. (MHC class I is the receptor that CTL recognize at the target cell surface.) 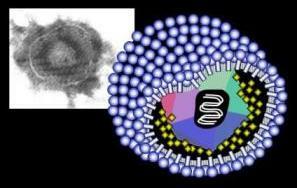 Such molecules are nearly universal among herpesviruses, and are common in adeno- and poxviruses. These immune evasion molecules are clearly critical to the virus’s pathogenicity. Any time you find yourself saying “clearly” you should beware, because it usually means it’s something that hasn’t been tested. In the case of viral immune evasion molecules, their in vivo role has rarely been looked at, at least partly because many of the molecules have been identified in human herpesviruses, which are highly species-specific; you won’t find many volunteers lining up to be tested with a mutant herpes simplex virus to see if it’s more pathogenic. But there are a couple of mouse herpesviruses that have immune evasion genes, so the experiment can be done. You’d predict that a mouse herpesvirus lacking its immune evasion genes would be less pathogenic (because the T cell response would be more efective), and you’d expect that in the wild-type virus that contains its immune evasion genes (compared to the mutant virus) the CTL response would be smaller and weaker. Ann Hill has been testing this concept, and her findings are pretty disconcerting. So far there’s a series of three papers in which Ann looks at the effect on antiviral immunity when murine cytomegalovirus (image on right from the Oxenius lab) is stripped of its three known anti-CTL immune evasion molecules. In the first paper,1 the findings were simple: There was essentially no effect. During acute infection, there was very little difference between the two viruses2 with respect to the kinetics of viral replication and clearance, or in the size and kinetics of the virus-specific CD8 T cell response. During chronic infection … the size and phenotype of the CD8 T cell response to both viruses was remarkably similar. … Thus, restoring the ability of CD8 T cells to detect MCMV had little apparent effect on the course of MCMV infection and on the CD8 T cell response to it. Overall, the data indicate that the presence or absence of MHC I immune evasion genes has remarkably little impact on the size or specificity of the MCMV-specific CD8 T cell response over an entire lifetime of infection. (1) Is there some problem with the experiments? One concern I have is that these were done in C57BL/6 mice, which are known to be highly resistant to MCMV through NK cells (i.e. before CTL even get involved), and this resistance is unusual among mice.5 Maybe in other strains, evasion of CTL would be more important. The problem here is that even if it’s true, Ann looked specifically at CTL responses and didn’t find that they were much changed by the immune evasion molecules. Even if CTL are not important the immune evasion molecules are apparently targeting them. (2) Maybe CTL are not as important for immunity as we might think. In general mice and humans lacking CD8+ T cells or components of the MHC class I antigen presentation pathway do surprisingly well, immunologically. They can generally deal with viral infections reasonably well (though not as well as intact individuals). Maybe there’s just so much redundancy that CTL can be skipped without altering overall immnunity much. Doesn’t get us over the problem that there was no difference in the CTL response specifically. (3) Maybe immune evasion genes are not all that important. Perhaps they confer no more than a small replication advantage to the viruses. But then why are they so univeral among these viruses? Given the lack of effect that Ann sees in MCMV, you’d expect to turn up, say, clinical isolates of human cytomegalovirus that have dropped some of their immune evasion genes. But as far as I know there are no such examples; the immune evasion genes are tightly conserved. (4) Maybe the immune evasion genes are only important under specific circumstances, that weren’t present in these laboratory-housed mice. Mouse to mouse spread, perhaps. That seems to be the most attractive idea so far, given the apparent effect in salivary glands only. Or perhaps these genes kick in when the mice are concurrently infected, or there’s some effect of stress that would be more important in wild mice. Hand waving, and hard to test. I think that viruses , because of their “construction” will always find the way to adopt.. I think that we all look in wrong direction when when talk about viruses, the ozone from the atmosphere is very very effective and there are lot of clear evidences about it … but clearly there is no interest to “go” in that direction because lot of big companies will lose money…and at the end that is the most important thing! why now a lot of new virus virus appear?